Well, my past few posts of cards haven't used any Sassafras Lass product, and I think subconsciously I was going through withdrawal! I just noticed that all three cards I have to post today use Sass product. Hee hee! First up is my card for sketch #100 at CPS! Like I said a few posts ago, we are having a HUGE celebration, because not only did we reach 100 sketches, but our 2 year birthday is the week of February 14th! So, we are having a huge party for the next few weeks! 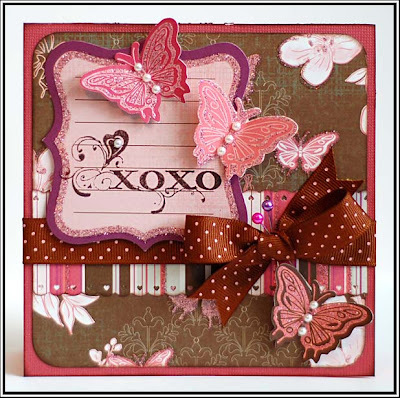 This week my sponsor was Cornish Heritage Farms, and we got this gorgeous stamp set called "Vintage Butterflies". It really is a beautiful stamp set, be sure to check it out if you get a chance! 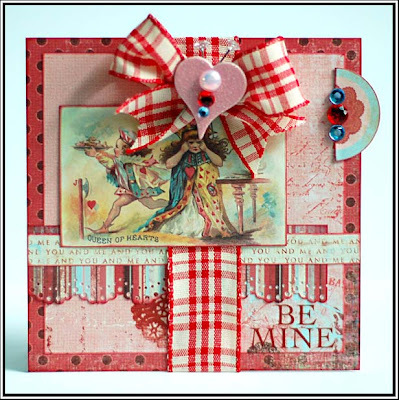 The best part about this card is I used up a every Sassafras scrap I had from the "My Dearest", "Pocket Full of Rosies", and "Woodland Whimsy" lines. Gotta love that! 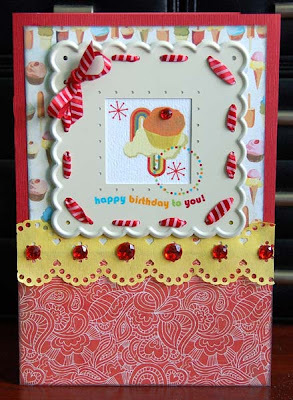 Next up is my card for the Cardalicious #11 challenge, to use a journal card/tag, green, and orange. I wasn't too fond of this card until I added the sticles (they look better in real lfe. Glittery, not chunky), but now I love it! This uses the "Happy Place" line by Sass...one of my faves! And last, but not least, is my card for Sketch This: 76. I am so glad that this sketch blog is back up and running after a bit of a break! It is one of my faves! 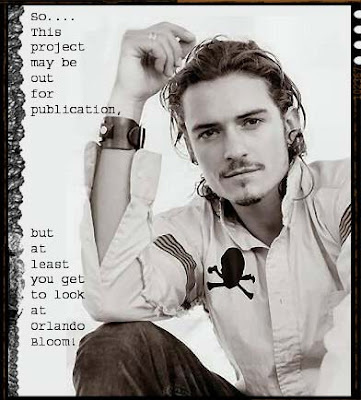 Be sure to check it out...they post layouts and cards for each sketch! I used the "Hog Heaven" line by Sass for this one. So, has everyone had a good week since my last post? Like I said, we went to watch Casey play basketball on Tuesday night. They lost by three points, which was a bummer, but Case had a great game! He made 2 of his 4 3-point shots, and 4 of his 7 field shots. I don't know his other stats, but he played hard. They really should have won...but played a really bad 4th quarter, and dealt with some bad reffing the entire game. Oh well...nothing they can do about that now. I got some good shots of Case playing...if I think about it, I will share them when I get a chance! Nothing else real special going on here! Just normal stuff, like work, dinner, cardmaking, and hanging out with Josh and the pups. Oh- our poor Bailey dog (the yorkie) hurt his leg on Monday night, and I had to take him to the vet on Tuesday. Thankfully he is okay, and was sent home with some anti-inflammatory medicine. He is back to his normal self, but we are trying to keep him from rough housing with Sadie (the cocker). That is what caused it in the first place! She isn't agressive with him, but he is with her...so I daresay that his knee injury is HIS fault. Hee hee! Cupcake fun at 2 Sketches 4 U! Up next is my card for the bonus sketch this week at 2S4U. The sketch was done up by Rae Barthel, one of the DT members of the blog. It was a fun sketch to work with, so be sure to scroll down further in the post to see it! 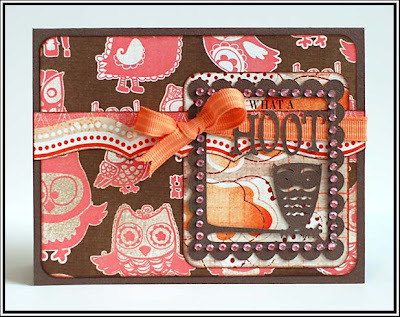 I used some Creative Cafe felt as my background, and some October Afternoon and Heidi Swapp paper scraps on this one. 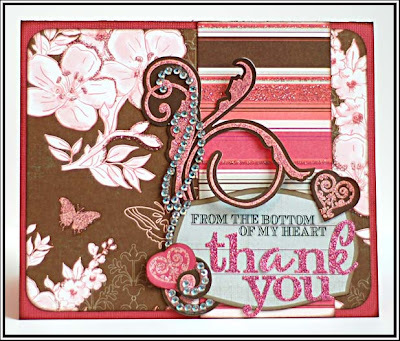 AND, I so used the collection name from my first card as part of my sentiment...I was totally inspired! 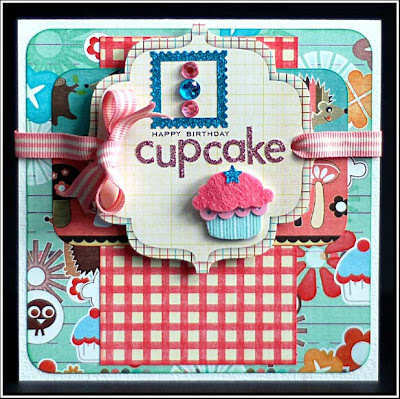 And those cute cupcake stickers are from Martha Stewart Crafts. Love them! I came upon another sketch blog recently called "Friday Sketchers", and fell in love with the latest sketch. So, of course, I had to whip something up for it. This is my card that is inspired by sketch #36. 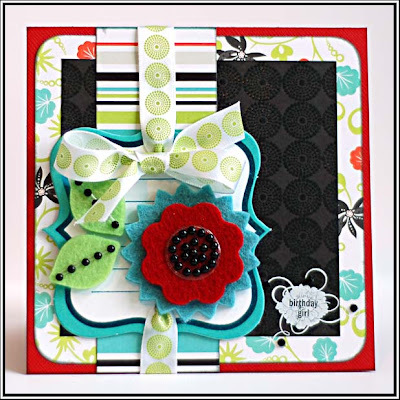 Love having another sketch blog to frequent...I think I am addicted to card challenges! Hee! 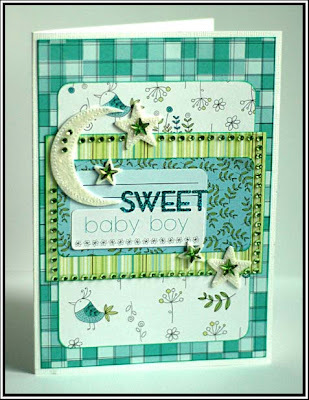 This card has Glitz Designs "Hot Mama" and Little Yellow Bicycle "Love Letters" collections mixed together. The diecut accents were cut out with my Cricut Expression and the cartridges "Storybook" and "Going Places". My blog friend Katie asked about how I take photos of my cards. I don't have a light box, but I do have a procedure that seems to work for me. I am no pro, but most of the time I think my photos look pretty good. So, here is my process. Part of my desk faces east, and that is where I set up my cardstock backdrop. 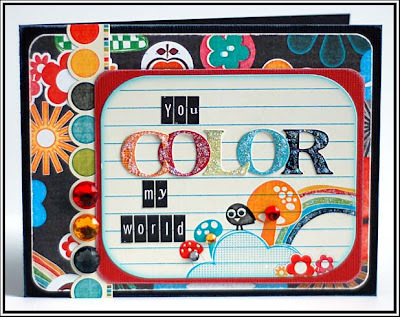 I normally use white, but if the card is primarily white, I will use black or a coordinating color. The window streams light in from the north, so during the winter I can get good shots from 10a-3 or 4p, and in the summer...about 7a-9p. If I have a lot of light coming in from outside, I don't turn the lights on in the room at all. This helps keep the natural colors of the card. If it is a bit dreary or cloudy out, I will turn on the main light in the room, and the lamp furthest from the east side of my desk. Any lamp light too close causes weird shadowing and coloring. Once the photo is on my computer, I adjust the levels in Photoshop, run an unsharp mask, and run my card frame action. That is my process in a nutshell. If you have any questions, feel free to ask! That is everything I have to share craft wise. We are going to watch Casey play basketball tonight, so we are excited for that! Basketball is harder to make it to than football, so this is a treat!! Plus, they are playing the Drummond Trojans, and they have a good relationship with that team. So, it is always fun to play them! And one last thing...I know it isn't Christmas anymore. But, I was searching for something completely different on Youtube last night...and this part of the movie Elf came up on the search. I LOVE this movie...and this is my favorite part. I laugh hysterically every time I see this part...so I thought I would make you laugh today! Are you ready for LOTS of cards? Happy Sunday everyone! I was a card making fool yesterday, so I have a lot to share with you today! But first, I want to remind everyone to head over to the CPS blog. We are celebrating our 100th sketch this week, and for the next three weeks we have 3 sponsors a week, and LOTS of giveaways. 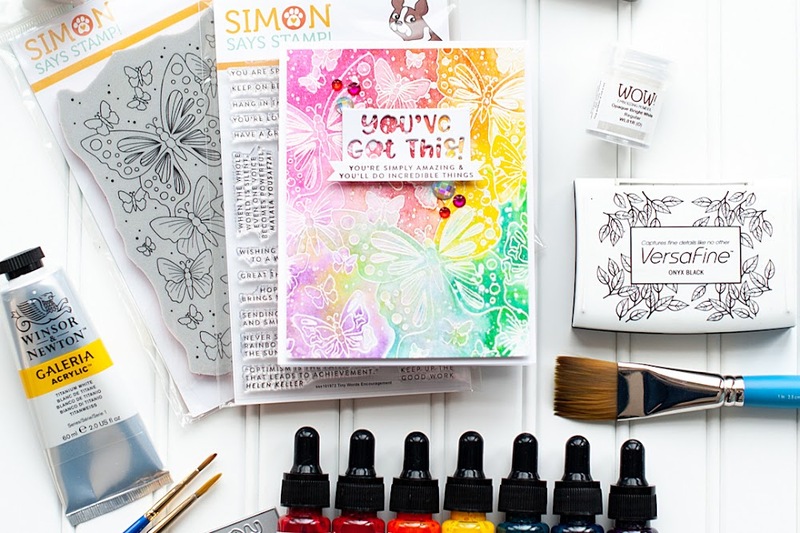 AND, the card that you make for sketch 100 might just get published in the September 09 issue of CardMaker's magazine...check out the CPS blog for all the details! My card will be posted on Thursday, so check back then if you would like to see it! While doing some blog surfing yesterday, I found a blog called "Sketch Saturday" and this is my card for sketch #35. I think most of the participants are from elsewhere in the world, which is very cool...can't wait to read their blogs. And, they do a lot of stamping. Well, I have never claimed to be the best stamper in the world, but I did do some basic stamping on my card for the sketch. And, I seem to be getting better at stamping as we continue to get more stamping sponsors at CPS...I just have my own way of doing it! This card features a lot of product from the "Chocolat" line by SEI. I love this line...and that background paper is my fave from the collection. 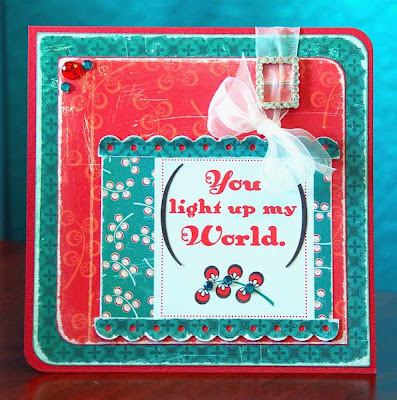 This card uses up the paper scraps from that first card...and I just love the sentiment! 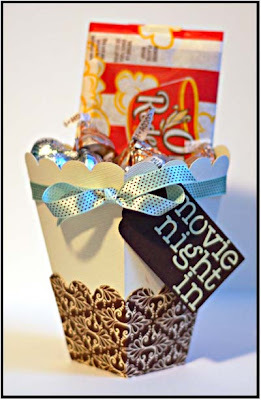 Those tiny letter rub-ons are by Creative Imaginations...and I think I have found a new love. I don't see them on their website any longer, so I am very glad I have a couple of them (they are the Swatchbook rub-ons). I just recently got this entire collection of SEI paper called "Black Orchid" in one of my Cards Magazine goodie boxes, and I came upon it when putting away the "Chocolat" papers. So, I decided it was time to break it out...I am loving the colors of this paper!! This card uses up all the scraps from the card above. Aren't those felt flowers adorable? Provo Craft made them when they were still producing non-tool items...and I loaded up on them. Thanfully I did, because they aren't going to make them any longer as they have decided to become a tool only company. Pity- I love the felt stuff. 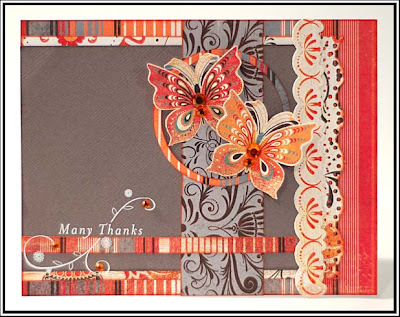 This card uses up some October Afternoon scraps that I have been hanging on to. I think this is a mix of a couple different older lines. 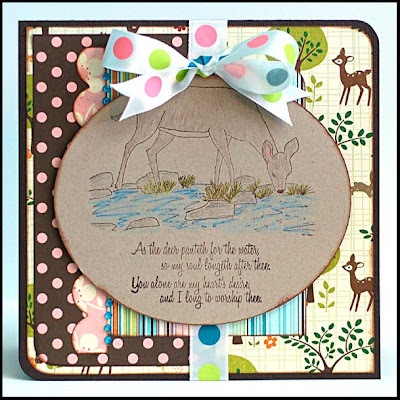 I just adore that cute deer paper! On this card, I broke into some new October Afternoon papers that I got from my lovely secret santa, Patrice. 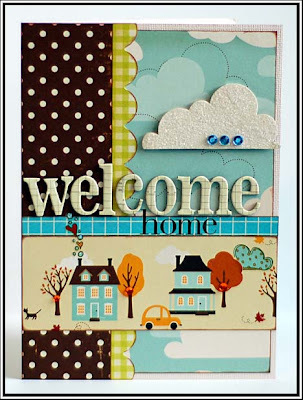 These are from the "Weathervane" collection...totally love those cute little houses. As I was going through my papers...I came upon this cute collection by Imaginisce called "A Shore Thing". And considering it is FREEZING here right now...I thought a little summer card was appropriate. Plus, I just wanted to use the cute hula-ing penguin paper and rub-on. Hee hee! 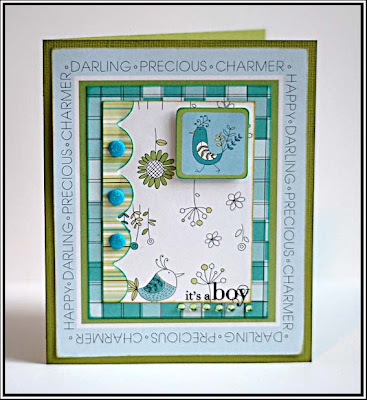 I did do another card with the scraps from this one...but I hate it. So, I am not posting it. It went directly to the crappy cards box. That is basically like getting a life sentence in prison at my house...it goes to the box, never to be seen again. Hee hee! Josh and I watched a pretty good movie yesterday titled "21" that is on instant watch via Netflix. If you have an XBOX 360 and Netflix, I recommend adding it to your instant watch queue and checking it out. We both enjoyed it. Be ready for a bit of skin because most of it is shot in Las Vegas...but it isn't vulgar. Heck- it is rated PG-13, so they couldn't show that much. Hee hee! I haven't done a music post in awhile, so I thought I would share a song and an artist that I love. His name is Joshua Radin, and I first heard this song when watching the movie "Catch & Release" (sidenote- I LOVE this movie. If you haven't ever seen it, I recommend this one too). The movie turned me on to his music, and I pretty much love everything he does. I have downloaded quite a bit of his music so far from iTunes, and hope to get more the next time I get an iTunes card. I hope you enjoy it! Well, that is all I have for now. I hope that you have a wonderful rest of your Sunday. I am off to switch the laundry around, and then back to make some cards! Love lazy weekends at home like this one! 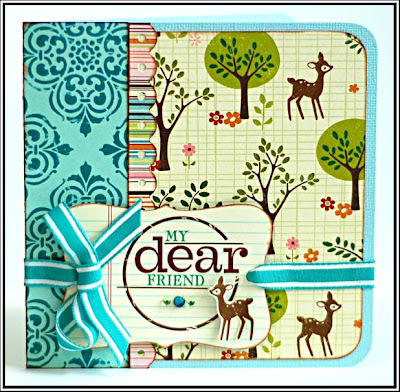 Up next, I did two cards for the Cuttlebug Challenge #15, using a Becky Fleck sketch and my Cuttlebug. 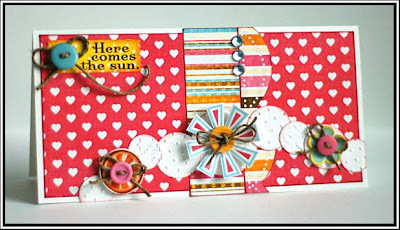 This first card uses up some fabulous scraps of the "Sunshine Lollipop" by Sassafras Lass that I have been holding on to (I know I use Sass product a lot...it is one of my faves!). 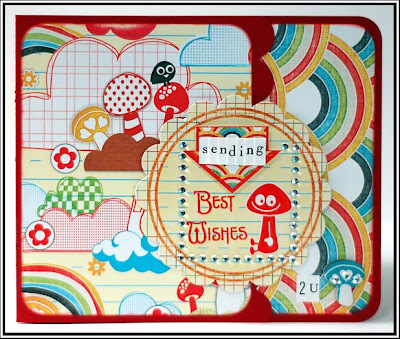 The circles are also all embossed using my Cuttlebug, and either the Houndstooth or Swiss Dots embossing folders. 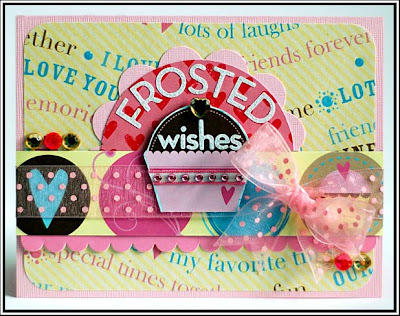 This second card uses some Scenic Route "Loveland" papers that I have never cut into...it was good to make myself use them! I just love the hearts! 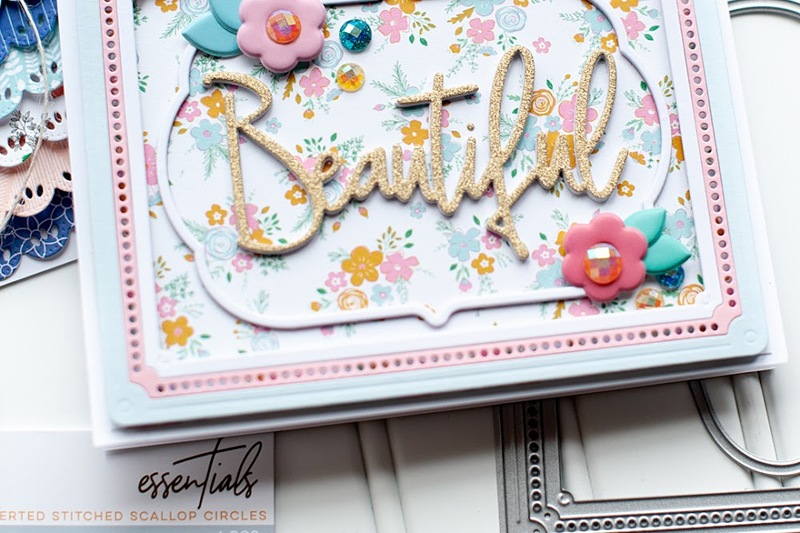 It also uses the Floral Fantasy embossing folder...I have had this one forever and never used it! So glad I am breaking out items that have been sitting in my stash forever! Up next are my January projects for Provo Craft. I was assigned to use my Cricut and non-licenses cartidges, on projects that don't pertain to any type of holiday. 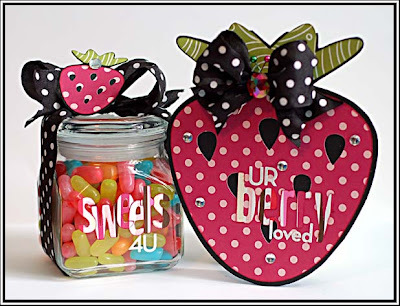 The first project is this cute Strawberry Gift Set, which uses the "Indie Arts" and "Street Signs" cartridges. 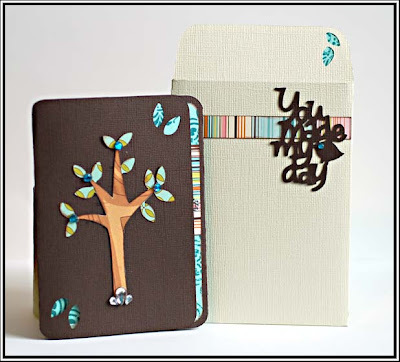 Next up is this Tree Card & Envelope set, which uses the "Wild Cards" cartridge. This was my first time using this cartridge, and it was fun! (This is card set #7, also called .) Lots of great things you can create with this one! Love it! And last, but not least, is this What A Hoot card, using the "Storybook" cartridge. There are TONS of fabulous cuts on this cartridge, and the greatest part about the letters....they easily cut at small sizes. The letters on this card were cut at 3/4 inch, but I had also cut them out at 1/2 inch to see which size I wanted to use...and those smaller ones cut out perfectly as well. Just be sure to have a sharp blade! That is everything I have to share today! I know- there was lots! Hope that it inspired you a litte, at least! 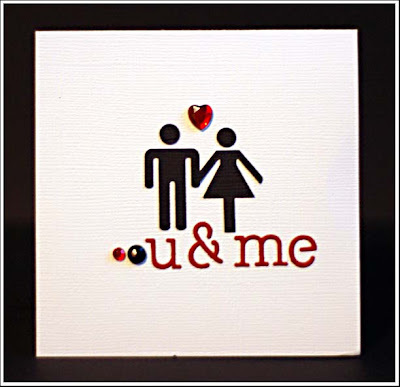 I will be doing some more cardmaking tonight, as Josh is having a video game night with a friend of his. So, expect another post in the next couple days with more to share! 2S4U, Cardalicious, and some CPS fun! Good Tuesday morning all! So, I know I said I would update my blog over the weekend...but we had some major issues on our desktop computer, which is what I normally use for photos, posting, etc. Josh is still working on the desktop, so I finally just used the laptop to do everything this morning, and will transfer everything over when it is back up and running. Ugh- computer issues!! And a little more CPS stuff to let you know about. I am providing the giveaway this week at CPS for one lucky participant. We are doing a review of sketches 1-99, so pick your favorite sketch from here, and whip up a card with it. Then post it on your blog or in your gallery, and link it in this cool new feature we are adding to the blog HERE. I will be picking a random winner from this list of links on FRIDAY...so be sure to use the Mister Linky's Magical Widget. How cute is that name?! Hee hee! The prize is an awesome one....this pack of Basic Grey "Ambrosia" paper. So, get going on some fabulous cards using past CPS sketches. And next week marks the 100th sketch at CPS! I can't believe how fast time has gone by, and how awesome it has been to work with Tami, the other CPS girls, and all our readers! We have some amazing celebrations planned at CPS starting next week, so be ready to stop by a lot in the next few weeks! Well, I hope that everyone had a wonderful weekend! I had a long weekend, as my company uses banker's holidays...so I had Monday off. Here is a recap of my weekend. Friday night I worked on some crafting stuff. On Saturday I drove up to Ronan to get my hair done. I went to lunch with my cousin Jamie, and then went to visit my grandparents for a little bit. On my way home, I stopped to see the preschool that Jamie opened up this year. It is fabulous...such a great place for kids to spend their day learning and having fun! Congrats Jamie...you did an amazing job with it! On Saturday night, Josh and I played a video game together that he just got from Gamefly called Eternal Sonata. It is fun, and I like the fact that I can play with him on the same team. My parents came on Sunday, and they took us out for another birthday dinner, and then I got to open some more presents. Monday I did some cardmaking, and then went to visit some friends with my parents. And Josh and I played that video game together again last night! Lots of fun this weekend...I hope you had lots of fun too! Well, that is about it for me for now! Have a great start of your week! Why yes...someone did turn 29 on Wednesday! Thanks for the birthday wishes via email, facebook, and here on my blog!! I really do appreciate it! I officially turned 29 on Wednesday. I definitely don't feel like I am a year away from 30, that's for sure! It was a good day! I woke up early with my husband, and opened my gifts from him before he had to leave for work. I got this pretty pink Ipod, just what I asked for! He also added in a clear case so I won't scratch it, some ITunes cards, and an FM transmitter for it. I am loving it! Welcome to this century Lea....you finally have an MP3 player! Hee hee! Then he surprised me with another gift, that I was definitely NOT expecting. It is a white and blue diamond necklace, and the pendant is in the shape of a circle. It is hard to explain, so I will try to get a photo of it this weekend so I can show it to you. Josh said it was kind-of a birthday gift, but it was also meant to mark something special that is happening in my life, and our life together. I am not quite ready to share all the details of what is going on just yet, but it is very exciting! When the time is right, I will let everyone know. I will say that I am NOT pregnant, nor am I starting my own scrapbooking line. Anyways- after work we went to dinner at a little restaurant called Ciao Mambo, which was very enjoyable. And then went home and watched American Idol. It was a great day! :) My inlaws also sent me some flowers at work, and they are beautiful! I will get a photo of them this weekend as well so you can see them! Today I just have a few cards to repost. January 1st marked the day I could load my cards that were in the November issue of Cards Magazine, and I figured today was a great day for that since I don't have anything new to share! 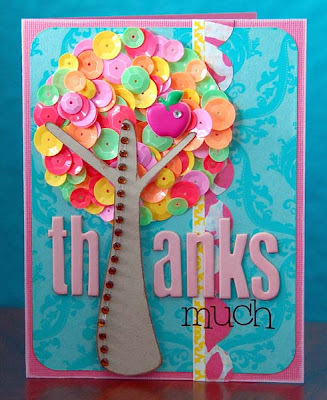 The "Thanks Much" card with the tree is still one of my faves. I will have some new projects to share this weekend...so expect a post with new items on Saturday at some point!! I hope that you have an awesome Friday, and a fabulous weekend! CPS 99, 2 Sketches 4 U & More! 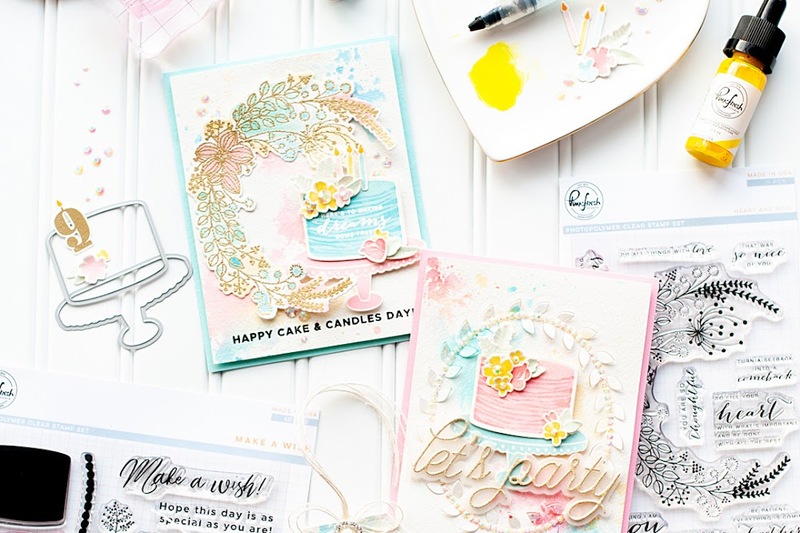 Well, I have been a busy little cardmaking bee lately, so I have a lot to share with you today!! First up, is my card for this week's sketch at the CPS Blog. 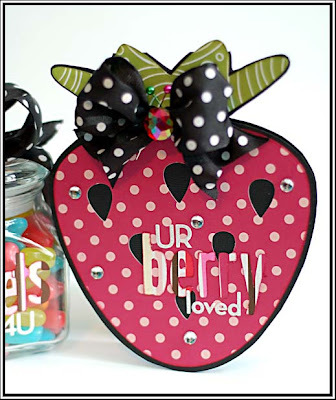 We were sponsored by DRS Designs stamps this week, and I just LOVE these cute little strawberry stamps that I picked out. They were so fun to work with, and I really love how the card turned out. 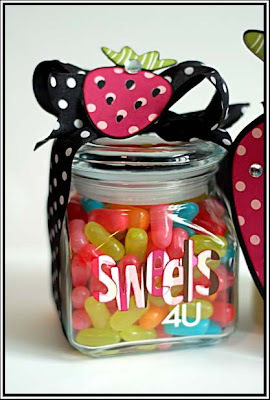 DRS Designs is offering up a prize for one lucky participant, so please come on over and play at CPS this week! The sketch is fabulous, and you could win some DRS Designs goodies! 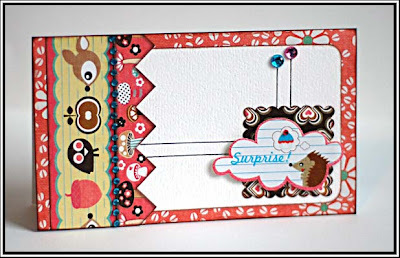 Up next is the card I got done for Laura's sketch this week at the 2 Sketches 4 U blog! It is a fun little sketch this week, and I decided to bust out this cheerful Sassafras paper collection called "Happy Place" for it. I don't know if you can tell in the photo or not, but the front flap is shorter than the back one, and that circle accent overlaps it all. The sketch has a peice coming off the side of the card, so I put my own little spin on it! That is everything I have to share for today! In other things, Josh and I watched a really great movie last night. We have a subscription to Netflix, and we have an XBOX 360...which means that all the movies/shows that Netflix has available for instant watch can be watched on our big TV via the XBOX. The movie "Vantage Point" happened to be available on the instant list, so we added it to our queue and played it. It was awesome. Very intense, very interesting, and a good ending. Definitely a movie worth seeing if you haven't...I recommend it! Well, I had better get going for now. I hope that everyone has had a wonderful start to your week! Happy Sunday! I hope that you have had a wonderful weekend so far. We got some much needed grocery shopping done yesterday! Nice to have some food selection in the house again...hee hee! I also was feeling super crafty...and got some cards done!! It is nice to get that feeling back again. I think the busyness of the holidays sucked it all out of me, but now I am back on track!! 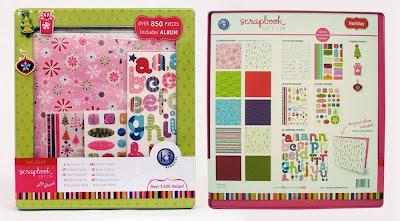 Josh and I are in savings mode right now, so I won't be spending much (if any) money on scrapbooking product for awhile. (Thankfully I have an ENTIRE room stocked full of product to use up, and just got some amazing goodie boxes from Cards Magazine. Those will come in handy while I am on a spending freeze!) I am in a Valentine's/love mood these days, so I am very thankful that I have quite a bit of this My Mind's Eye paper collection left. 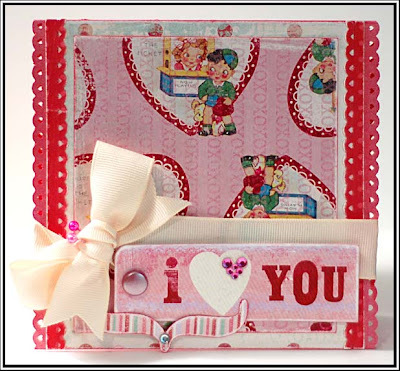 It is one of my favorite Valentine collections ever, and I think that is why I didn't use much of it. I just wanted to look at it! Hee hee! So, I busted it out last night and made up these two cards. I am trying this new thing where I immediately use as many of the scraps to make another card, and then toss the tiny peices that are left. 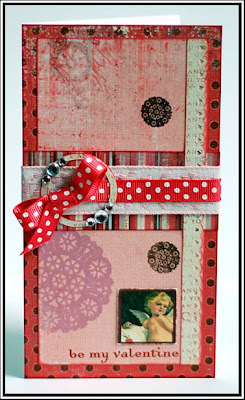 I notice that I never go through my stack of scraps...so using it up is the better idea!! First up are the two Valentine's cards that I got done, and used the majority of my scraps up on the second one!! Isn't the ribbon on that first one GORGEOUS! I had a store credit to Michael's, and one of their sections of ribbons was 50% off last week. So, I did stock up on some ribbon with the store credit since it was such a great price! 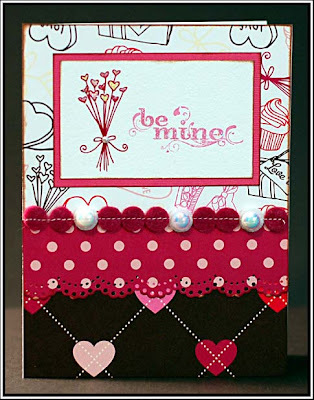 Next up are some cards with the FABULOUS Ambrosia line by Basic Grey. I just love the colors and patterns of this line, the grey and orange are awesome!! That cool sun looking accent was cut using my Cricut Expression and the Accent Essentials cartridge. That is one of my all-time favorite carts...and it comes with the Expression. Gottta love that!! The second card used up almost every single scrap from this first card, minus the butterflies. And last, but definitely not least....I got this cute little card finished. 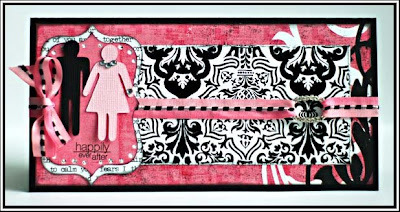 I just love this cute stamp set called "The Birds and the Bees" from the Kim Hughes collection by Cornish Heritage Farms. 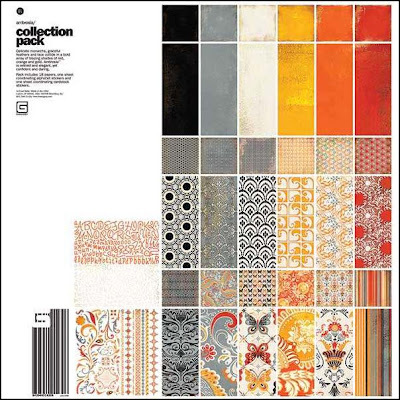 Be sure to check out the entire collection if you have a chance...it is just utterly adorable! I see many more super cards to come with it! Those are all the projects I have to share today!! 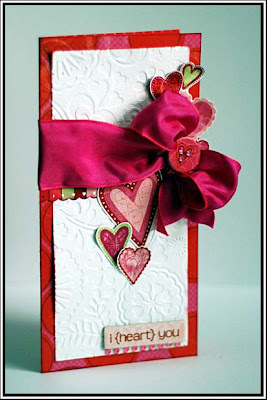 I am going to do some more cardmaking today, so be sure to check back soon and see what I have posted!!! 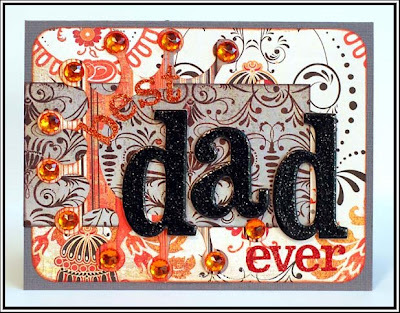 I am especially excited about how my CPS card turned out this week...so check back on Tuesday when I post it!! Now a random music interlude for you....I love all kinds of music. I was only born in 1980, but I had young parents, aunts and a couple of cousins that I spent a lot of time with. So, I have a love for 80's music. I spent every summer away from my mom, and in Montana with my dad. Lots of songs remind me of the happy times during the summer, even though I missed my mom so much. I am reminded of hot days at the lake, boating and swimming. I remember riding with the top down or all the windows down and feeling the warm wind rush through my hair and past my face. I am reminded of tater-tots at Lynn's drive-in almost every single day with my aunt Amy, and my cousins Tammy and Cassie. I am reminded of the fact that me and my cousin Brandy would wear swimming suits all day long because you just never knew when we were going to jump into grandma's pool, or take a trip to the lake. These memories make me smile. This song was a favorite of many of the adults in my life, so I remember it well. It is one of my favorite 80's songs ever, I smile whenever I hear it and think back on those good times. Little trips down memory lane are fun...thanks for taking a small one with me. First off...thanks for sharing some of your hopes and dream of 2009 with me. I pray that each and every one of you gets your heart's desire this year, no matter how little or big it might be. Here are the randomly generated numbers for the winners of the Cardmaker Sketch Book, and the KI papers. Each winner will get a collection with both items. Thanks and best wishes for 2009! Your projects are just beautiful!! I'm making my hopes and dreams really easy this year. I picked 1 word for 2009 and it's FOCUS. I figured if I focus I will be able to organized, play more, finish projects, and evey spend more time with the fam. Thanks for a chance. Happy New Year to you Lea and congrats on getting your cards published in this sketch book. I would love to win one of them....I am so addicted to sketches right now. I hope that in the year 2009, my DH's business takes off and we can re-gain financial security. 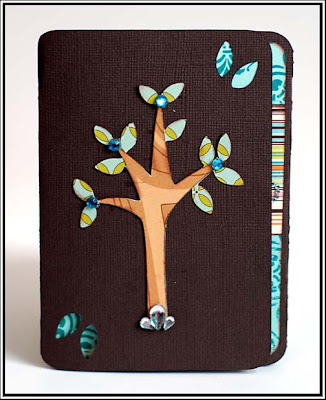 I also hope to be published in a paper crafting magazine. I just have a few things to share tonight. These are my Provo Craft assignments from December. I was assigned to do a Cricut project, and Cuttlebug project, and then a project with my tool choice...using Winter or Valentine's themes. This is what I came up with! 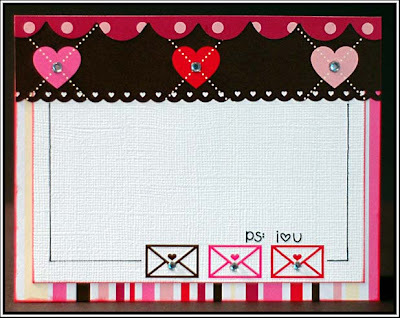 This is my Cuttlebug project...I used the 2x2 Man and Women Sign dies, along with the Typewriter alphabet. Just added some rhinestones to this clean and graphic card to finish it off! I like it! And this is my Cricut project, using the Stretch Your Imagination cartridge. This is the card function of the sled cut on this card...with a few little things added to it. Well, I hope that everyone has had a wonderful week so far!! And have a very happy weekend, whatever you may have planned! I think we are going to be a little lazy this weekend....and that works for me! CPS, 2S4U, and a little more giveaway!! Happy Wednesday everyone!! Hope your week has gone well so far! If you haven't left a comment on THIS post about your hopes and dreams for 2009...be sure to do so. To give you a little more incentive...I am upping the ante. Last night I picked up this cute tin on clearance at Target. Well, it comes with 4 sheets of each paper...and I pretty much never use more than 1 sheet of any paper. 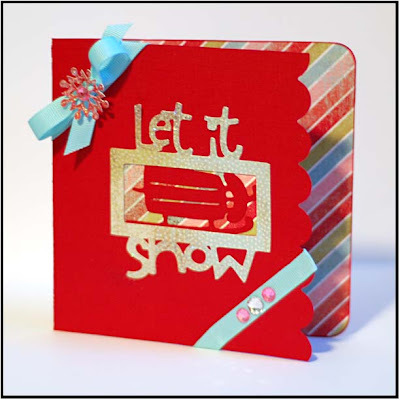 SO...I will be adding a collection of this cute KI Christmas-y/New Years-y/Wintery themed papers to the awesome new Card Sketch Book by Cardmakers Magazine. You have until the time I decide to post on Friday to leave a comment! I have loved reading about everyone's hopes and dreams for 2009. You might wonder why I asked about hopes and dreams rather than resolutions? Well- I don't know many people, including myself, who have ever kept a resolution. But hopes and dreams...they can last forever, and the are ever changing. And as you reach them...you can continue on hoping and dreaming. I like that far better than making a resolution I can't keep. :) I look forward to reading more in the next few days. Up next is the card I got done for this week's sketch at 2 Sketches 4 U (gasp!). It has been awhile since I have been able to join in over there...and I missed it! The sketch is fabulous this week...check it out here. 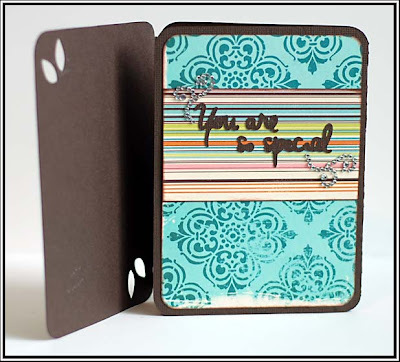 This card is built on a Sheetload Shortcuts transparency (which are FABULOUS btw)...so it wasn't easy to photograph. Hope you get the gist of it! And now some randomness. I spotted this coffee mug while picking up some necessities at Target last night. I am surprised I didn't break it, considering how quickly I plucked it off the shelf...like someone was going to come grab it up before me. Nevermind that there were at least 10 of them on the shelf...I wanted it that bad. Tee hee...isn't it adorable?! 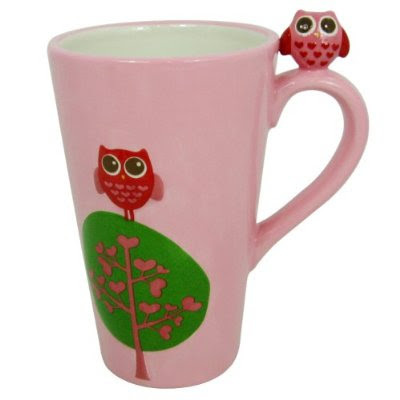 Can't wait to have a cup of coffee or tea in it soon! And before I sign off for now...I leave you with a song I just love by Band Of Horses. Hope you like it!